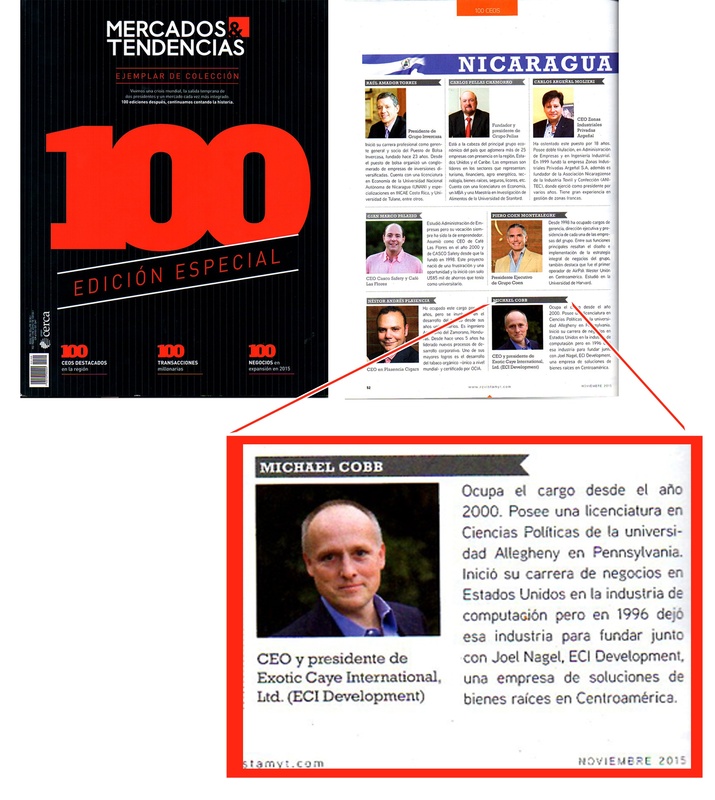 MANAGUA, NICARAGUA – Dec. 4th, 2015 – Michael Cobb, Chairman and Chief Executive Officer of ECI Development Ltd., has been named by Central America’s Mercados y Tendencias Magazine as one of the “100 Outstanding CEOs in Central America and the Caribbean.” Recipients were selected based on their “entrepreneurial quality, their records and their managerial mystique,” said the magazine. ECI Development has with portfolio properties in four Latin countries in the Americas – Belize, Costa Rica, Nicaragua and Panama. Cobb is a knowledgeable expert about the opportunities and challenges for North Americans who pursue an overseas retirement lifestyle as well as how to build new urbanist communities in the region. A Zogby survey shows that 11% of U.S. households want to own property overseas. The market comprises more than 5 million North Americans living outside the U.S. right now. Of these, 600,000 are retirees, and the number keeps growing. Cobb is an expert on the demographics of the pool of overseas buyers and has authored 15 Massive Mistakes People Make When Buying Property Overseas and the 3 Simple Steps to Avoid Them. Based in Managua, Nicaragua, Cobb speaks at dozens of international conferences annually about offshore real estate finance, development and ownership. He has been a consultant to The Oxford Club, hosted a weekly radio program, contributes regularly to overseas publications, sits on the board of international companies, and gives counsel to various real estate projects throughout Latin America. He understands the challenges of navigating Latin America’s complex business system, and building waterfront resorts during good economic times and bad. He is a native Western Pennsylvania and a graduate of Allegheny College.